Permanent makeup refers to the use of implanting permanent pigments into the dermis to emulate makeup. These “tattoos” are often used to enhance facial features like the eyes, eyebrows, and lips. Permanent makeup tattoos have become increasingly popular in recent years.1,2 However, what is also seen along with this surge is an increase in patients looking to remove their permanent makeup, either due to the makeup no longer suiting them or their lifestyle, or due to unsatisfying or inferior results. Poorly administered permanent makeup results usually occur because of a lack of training or technical skill on the part of the technician. Due to the lack of trained technicians available, permanent makeup removal is a skill that medical aesthetic clinics should consider providing, especially if they are currently providing tattoo removal. There are several methods of tattoo removal available, all which function to remove pigment molecules from the skin: topical treatments, non-laser treatments, and lasers. These vary by effectiveness; hence, practitioners should be wary and exercise their own due diligence when offering an effective makeup tattoo removal solution. Topical treatments, such as imiquimod and tretinoin, are being sold as stand-alone tattoo removal creams, but these are largely ineffective without laser treatment. As the ink pigment is in the dermis layer, topical treatments are unable to reach or act on the pigment molecules.3–5 However, some topical treatments, such as imiquimod, have been found to increase the effectiveness of removal with laser when compared with laser treatment alone. As well, with new tattoos (< 6 months old), a simple regiment of fine sea salt application followed with gentle exfoliation twice a day for a period of 2 months, can help reduce the number of laser sessions needed to remove the tattoo completely. By far the most effective and common treatment for getting rid of pigment from the skin is through the use of lasers. Specifically, the most common laser used for this type of treatment is a Q-switched laser, specifically of the Nd:YAG wavelength. These lasers are the current gold standard of treatment due to its gentleness on the skin, which reduces the risk of scarring in that area. Nevertheless, using laser to remove permanent makeup can be complex and numerous considerations should be reviewed for optimal results, particularly the molecular size and composition of the pigment. This is because different makeup inks will react differently under the laser. For instance, the presence of titanium in the pigment may cause it to turn black from its original white base after being treated with a laser.9 This makes the treatment of tattoos with this pigment, particularly on the lips, with a laser unsuitable due to the high contrast of the result with the surrounding skin. Another factor to consider, molecular size, comes into play when determining the type of laser treatment and wavelength. Unlike the carbon molecules that make up body tattoo ink, the ink used for cosmetic tattoos are primarily composed of large molecules like titanium molecules. 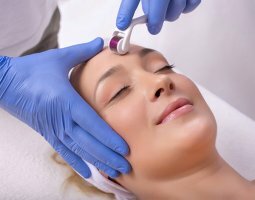 Generally, nanosecond lasers are more effective in the treatment of makeup tattoo removal than picosecond lasers, because they are better at targeting the larger-sized molecules that comprise cosmetic tattoo pigments.10–12 It typically takes up to 10 treatments for the face and 12 for the body when using lasers to sufficiently break the titanium molecules down. In order to minimize the number of laser sessions when treating pigments that contain molecules of larger size (e.g. skin-colored pigment), it is recommended that the laser therapy be combined with 2 to 3 non-laser solution sessions to hasten the removal of pigments from the skin. Another issue to consider is the age of the tattoo. It is not recommended to use lasers to remove tattoos that are less than 6 months old,13 mainly due to its ink concentration. Newer tattoos still contain a high amount of ink pigments, which means that the patient will have to undergo more laser sessions than is typically recommended. Also, the laser reacts more strongly to higher concentrations of ink molecules, even on low power settings.14 These factors mean that the treatment is overall harsher, thereby increasing the risk of scarring. Side effects include scarring, the risk of which may increase with progressive trauma to the skin; and allergy, which may occur even if the patient did not previously show any indication of hypersensitivity. In order to minimize the chances of side effects, treatment should entail the fewest laser sessions necessary.16 While the current advanced state of permanent makeup removal technology can provide optimal outcomes, further development in this area is still needed. In order to generate the best possible outcomes for the patient, the risk and benefits of the various types of tattoo removal procedures, as well as other factors like pigment colors and the patient’s propensity for scarring, should be carefully weighed in order to develop an effective treatment plan.